"He Created A Place Where Hope Survived" Paul Rusesabagina was assident manager of Hotel des Mille Collines, and when everyone abondoned them he became manager and opened it up as a refugee camp. He was born on June 15,1954 and was a Hutu, yet he married a tutsi and had three wonderful children, at one point before the genocide the tribes lived peacefully together and were intermarried, like Paul. He saved over 1,250 people during the genocide and kept them safe as best as he could. The movie shows us what a true hero he is and how amazing what he did was. During the genocide he sent faxes and made phone calls to Bill Clinton and the king of Belguim to get help but everything they did wasn't enough, they turned their backs on the country and left the people to suffer. After all the national aid left and abandoned Rwanda he stayed and protected evryone he could, Paul opened his home and heart to the people in trouble and gave them a safe place to live. He created a place where people belived that they could live past the days of the murder and survive as a tribe. Paul not only created a safe home but he did it with love, and this love came from his heart and that is truly heroic. "I Connot Leave These People To Die" He put himself second and in danger in order to keep everyone else safe. He protected people and risked everything to save their lives. He is a true hero and needs to be regonized to the public for his heroic acts and his insane amount of bravery and the love he has for mankind. He is a hero in any way you can think about it and he is my hero, he saved very many lives and put his own at risk to keep all the people thaat he could breathing. When all else failed Paul was there to stay and help the people suffering, and at that he did an unbelievable job. Paul is certainaly worthy of anything and has a heart bigger than ever imagined, he is living breathing proof that superhero's do exist and can live amoung us and save people in a time of need. He is a Hero to all. Paul left, His wife right. Paul and his family are now living in Brussels, Belguim with their three kids and two adoptive nieces. They adopted their nieces when they found them at refugee camp after they knew their parents where dead and the girls where hiding in a hutu neighbors home for safety. 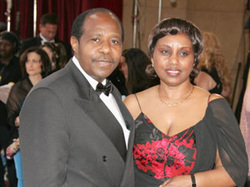 Want to learn more about this truely brave and inspiring person, Paul Rusesabagina cllick on these links below and enjoy more about his heroic life.